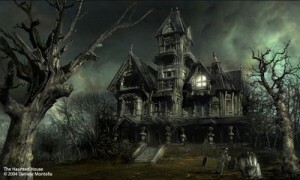 Haunted house dreams are very complex dreams and not always as easy to interpret as other dreams. They are actually two dreams in one, a house dream and a ghost dream. Either of these dreams are rather complex on their own and have many clues and symbols associated with the interpretation of their meaning. For this reason I will be presenting this article in four parts. This, the introduction where we will discuss some psychological and spiritual thoughts, as well as things you should look for and remember about your dream. The house, different aspects and symbols and how they pertain to your dream. The Ghost that is haunting you in your dream, and finally I will present a couple of examples along with a possible interpretation. To dream of a haunted house, signifies unfinished emotional business, related to your childhood family or dead relatives or repressed memories and feelings. Most haunted house dreams are typically recurring dreams and there are those that think that this could have something to do with the dreamers surroundings or sleep environment and most recurrent dreams are relevant to the unresolved issues of the person who is dreaming even though he may not presently know what the issue may be. Dr. Daniel Condron (Director and Dream Researcher at the School of Metaphysics) believes the dream represents a question or message (often related to a limitation, habit, fear or doubt) of the dreamer. And he thinks that the dream will stop repeating once the dreamer understands the message and resolves to make the needed change. There are many clues and symbols in your dream that you should take careful note of. These clues and symbols will give enormous insight to the true meaning of your dream. The following is a list of some of these clues and symbols to remember about your dream. Note being chased through the house by the ghost in your dream, adds new complexity to the interpretation of the dream call chasing dreams but we will cover that dream type in a future article.